Re: Calidar: Beyond the Skies!!! Bruce is still hammering away at this one just now, and I'm testing stuff for layout and maps. It's exciting stuff. Turns out this is growing into quite a large book, certainly much larger than I had anticipated. My guess is it may top 150 pages when the smoke clears. The treatment of each pantheons is detailed (to say the least) and insightful. Individual gods' descriptions average 1,100-,1,200 words each. One thing I discovered is that CC1 is an opportunity to discover interesting details about the realms of the Great Caldera, and the three moons, because the gods reflect their mortal followers, and therefore, the histories of their pantheons and of the individual deities unveil all sorts of information about the land and the mortals living on them. Providing the histories of the pantheons (listed under "Genesis") generates timelines of events prior to the common era. I also want to include a short PDF for each pantheon, which could be handed to players. The book provides a lot of information that should be for the eyes of referees only. Ooh, more about the world soul!! The concept is something I freaking love, I can't wait to get this new book. 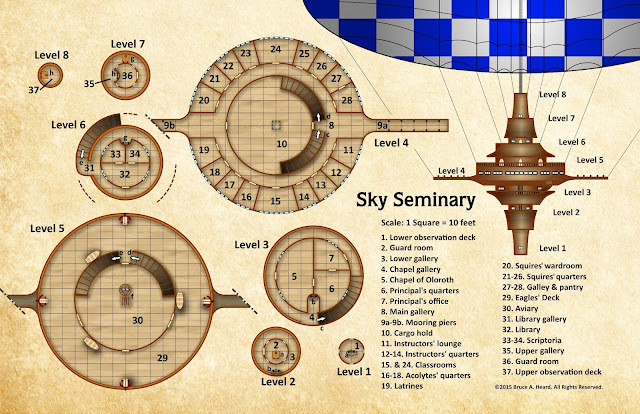 The Beyond the Skies Kickstarter has now opened. You can discuss it in this topic. As mentioned elsewhere, I am now backing this. Who else here is a backer? Uh, yeah. As with last time, I'm going for Captain, the hardback book level. Also the softcover CST1 and CST2. I'm backing at First Mate with a core softcover add-on; I missed out on the original release, and want physical copies of both books. Depending on how my budget looks near the end of the month, that may end up getting upgraded. Hey gang, there's a special Calidar event on Tim Brannan's blog tonite, at 11:30 US Central Time. You can have peek now --click here. That's just for fun and music. Thank you! This extra time will be very useful to shoot for the upper level goals. This will help make a decent book grow into a great one! #Calidar "Beyond the Skies" is fast approaching its next stretch goal and reaching the end of its crowdfunding campaign. Will you put some of yourself into this fabulous book and join the effort to commission more internal art? "Beyond the Skies" has already grown from 220 to 244 pages... will today add more? I just received the hard copies of Beyond the Skies and Skies of Fury and the both look gorgeous!!! I have my books. They're beautiful. The Dark wrote: I have my books. They're beautiful. Glad you got them. Anyone else out here got theirs too? I received my order about a month ago or so. The 3 books are wonderful so is the cloth map of the gods. But being busy I only start reading it recently (I work shift, so reading is a good way to spend my night off without waking my spouse or daughter). So far I've read about the Pantheon of Alfdain, Araldur, Belledor and Caldwen. So far I really love it. I particularly love the fact that the Dwarven and Gnomish Pantheon are matriarchal...a nice change of the usual Patriarchal one in most fantasy RPG. And I love how my "name a God" contribution was used to name the Patron God of the sharkmen. Definitely going to have fun with it...and eventually convert him to the Game system I own. 2 questions about that while I'm here. 1) Where the gods named by backer already created (and awaiting their name) or where they created afterward based on the name? 2) Was the death of the original God of the sharkmen already planned as detail in the Alfdain section? Boneguard wrote: ... I particularly love the fact that the Dwarven and Gnomish Pantheon are matriarchal...a nice change of the usual Patriarchal one in most fantasy RPG. I'm glad you said this. I was a bit worried since a few people manifested concern with (or polite dislike of) this approach. I made a point to include the same number of male and female deities (all pantheons combined) in the book. Some pantheons, clearly, are matriarchal -- that is, either the ruler is female, or female gods outnumber males. This is most evident with the gods of the fellfolk, who are females except for one demigod serving each one of the others periodically. He is prophesied as becoming the pantheon's ruler sometime in the future. It is an abstract concept, as this male demigod personifies the passing of time and, as such, he serves one after the other the coming of life, the four seasons, and death, before starting the cycle anew. On the other hand, the gods of the gnomes are all males, except their ruler who is a female. This event was written in early on, when I established the elven pantheon's history. A number of gods and demons get mercilessly decimated in the pantheons' so-called " mythologies." The appendix section often addresses the subsequent void left by this onslaught, following the idea that if deities and major demons are felled, who then takes their places? Are they legitimate heirs or opportunistic usurpers? Or have the fallen actually survived under other forms or other names? Were there subsequent tales to tell that did not transpire in the mythologies? I can indeed see how some people would not like it, it is a big change for two culture that were always represented as patriarchal, but regardless I think it is a great idea and brilliantly executed. On the topic of the Gods, are there any plan to do a second book of Gods to cover the other pantheons (eg: Any (potential) Gods specific to Alorea, Kragdûr or Munaan not covered in Beyond the Skies, the Gods of Draconia, the Gods of Lao-Kwai, the Gods of the Kahuulkin, the Gods of Kumoshima, the Gods of the Wayfarers, the Gods of Felix Minor, the Gods of Canis Major and the Gods of Ghüle) or will they be covered if/when their respective celestial body will be covered (Eg Book on Draconia, a Book og the moons of Calidar, a Book on Lao-Kwai and its moon, a Book on the Fringe and a Book on Ghüle)? Many of these will probably be handled within their own Gazetteers. For example, as I work on Dreams of Aeries, one divine scion of Belgomeer is likely to get detailed as part of the adventure module itself. So, the value of the adventure is heightened with supplemental information unavailable in CC1 (but possibly formatted in a similar manner). No doubt the same thing can happen with treatments of Lao-Kwei, Kumoshima, and so on. Boneguard wrote: On the topic of the Gods, are there any plan to do a second book of Gods to cover the other pantheons (eg: Any (potential) Gods specific to Alorea, Kragdûr or Munaan not covered in Beyond the Skies, the Gods of Draconia, the Gods of Lao-Kwai, the Gods of the Kahuulkin, the Gods of Kumoshima, the Gods of the Wayfarers, the Gods of Felix Minor, the Gods of Canis Major and the Gods of Ghüle) or will they be covered if/when their respective celestial body will be covered (Eg Book on Draconia, a Book og the moons of Calidar, a Book on Lao-Kwai and its moon, a Book on the Fringe and a Book on Ghüle)? One more thing. Gods of Wayfarers are the same as those of Nordheim. Gods of Calidar's moons are largely the same as those of the Great Caldera (except for the fellfolk pantheon). Alternate versions of Soltan/Teos should come up on Munaan though (representing cultures that did not make it to Calidar's surface.) I would think that various monster gods can yet be fleshed out or invented whole cloth, as well as a host of divine scions, spiritual servants, and the odd incarnates, as part of adventure modules. I find these lesser "deities" more intriguing than the all-powerful gods because they offer a greater ability to interact with mortals. This being said, I think a Hall of Epic Heroes & Villains might also be an interesting and useful accessory. CC1's real value, aside from the gods themselves and their stories, is to help players flesh out their characters, their backgrounds certainly, but especially their motivations and how they might work to reach their goals. That would be a good way to go about it, yes. Besides I'm assuming they are specific to the whole planet (Unlike the case of Calidar where they are speciifc to one of many nations) that they can be covered piecemeal. I do hope that a Lao-Kwai/Kahuulkin/Kumoshima Gazetteer will be done soon. I love oriental settings and the Kumoshin ruled Island off of Caldwen needs its Gods too. That's what I tought, but it's good to know and does make thing easier. Ambreville wrote: would think that various monster gods can yet be fleshed out or invented whole cloth, as well as a host of divine scions, spiritual servants, and the odd incarnates, as part of adventure modules. I find these lesser "deities" more intriguing than the all-powerful gods because they offer a greater ability to interact with mortals. This being said, I think a Hall of Epic Heroes & Villains might also be an interesting and useful accessory. CC1's real value, aside from the gods themselves and their stories, is to help players flesh out their characters, their backgrounds certainly, but especially their motivations and how they might work to reach their goals. Looking forward to that. I do love the Calidar products and the flexibility provides. The "gods" of Draconia also are specific to nations. I established earlier that "living gods" rule mortal dragons -- these are somewhat analogous to Mystara's dragon rulers, a sort of super-dragons of divine ilk who dwell among their faithful. They are powerful, but not quite as powerful as the gods of Calidar. On the other hand, the latter live in Ambrosia, while the rulers of Draconia exist in the prime plane, mostly in their hollow world. What has not been unveiled, however, is exactly what Draconia's World Soul is and how it relates to its living gods... likewise the question: whatever happened to the good dragons? Another aspect of dragons also lies in those of Lao-Kwei and their relation with the red planet's moribund World Soul.